What’s the fun in regular dining? Here are few eating joints with unusual themes that give dining a creative twist. Get ready for a delectable read. This restaurant in Hyderabad provides its customers with the unique experience of dining in complete darkness. 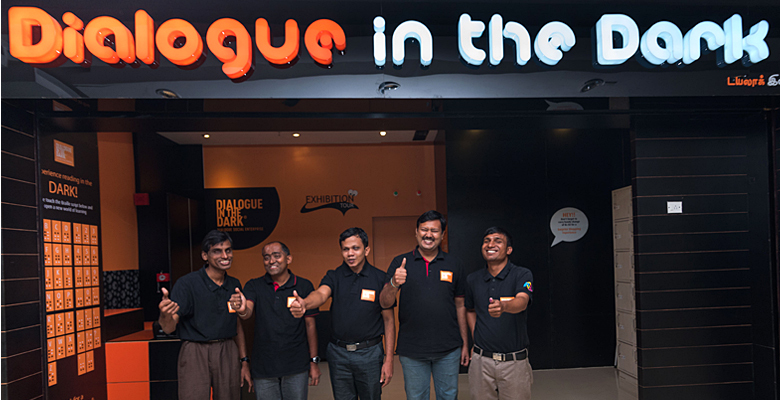 With the objective of sensitising people towards the visually impaired, Dialogue in Dark allows its visitors to spend the day like one by performing everyday activities in complete darkness. This applies to dining as well. A surprise four-course meal – vegetarian or non-vegetarian, depending upon the preference of the customer is served so that they could experience the food and appreciate it without sight. Trained by the National Association of the Blind (NAB) to take orders and guide the customers in and out of the restaurant, most of the staff here is visually impaired. This cafe is sure to take you on an unforgettable journey of exploring the world through the murk of darkness. Junked by Air India, fifteen-year-old Airbus A320 got all set for providing an in-flight dining experience on Ambala-Kurukshetra highway (NH-1) in November, 2018. Parked on a vacant one-and-a-half acre plot, Runway 1 is first of its kind to start the concept of dine-on-wings in India. 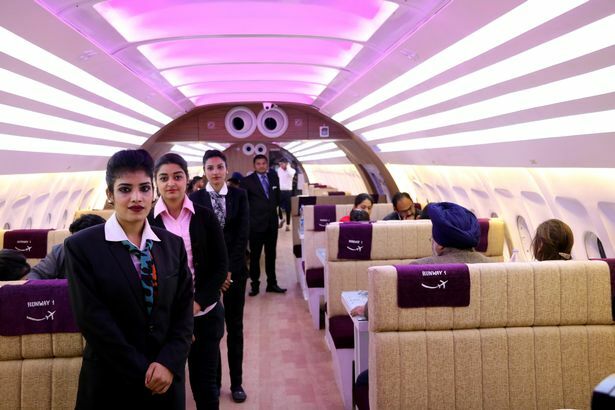 Uniform of the staff is similar to that of the cabin crew and ground staff. Adding on to the experience, the visitors are required to collect a boarding pass from the reception for entering this multi-cuisine restaurant. Runway 1 even offers a virtual 3D flight simulation gaming Setup. A branch has also been opened in the Metro walk Mall of Rohini, Delhi. This cafe is all geared up to give you a jet-lag free experience of dining in flight. 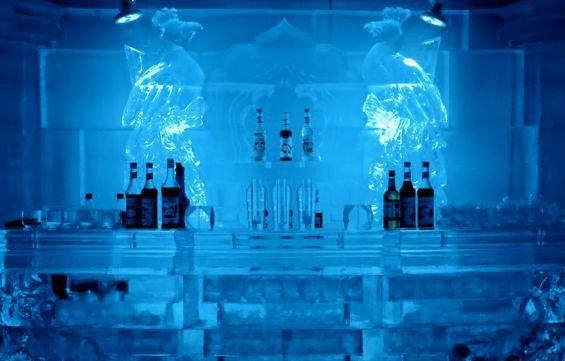 Justifying its name Fahrenheit 21 is the first ice bar of India with a temperature of 21 Fahrenheit (-6 degrees Celsius), maintained throughout the year. Lit in blue and red lights this place is different from other ice bars since it serves hot food as well-some of which is served flambéed. To survive the chilling ambience, customers are provided with furry parka (warm coats), gloves and insulated boots. What adds on to the fun is the furniture as well as the utensils which are made entirely of ice. With a sitting capacity of about fifty people, visitors are not allowed to spend more than forty minutes here. Don’t forget to head to Oshiara, Mumbai for this chilling experience. 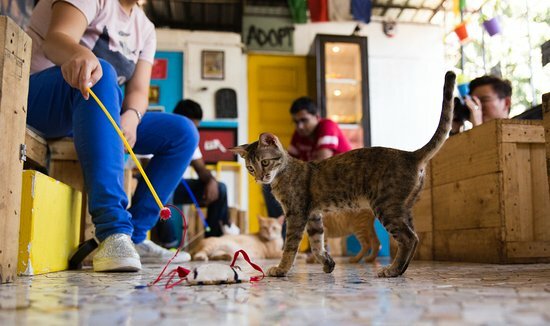 Situated in Andheri West in Mumbai Cat Café Studio is a cafe with a cause. Home to a number of rescued cats and kittens, CCS offers free adoption of our feline friends. All the kittens and cats here are healthy, de-wormed, de-flead and litter-trained. Visitors can donate cat food, treats, medicines and other cat-friendly gifts to support the cause. The cafe also organises weekly open mics, band performances, flea markets to open houses, adoption camps and more. Good food adds on to the –furry- experience. Kaidis’ Kitchen is a quirky prison-themed restaurant in Kolkata and Chennai. The restaurant is divided into nine ‘cells’ giving its visitors a chance to enjoy their food behind the bars. Waiters dressed like ‘jail superintendents’ take the orders while ‘prisoners’ serve them. Be it Thai, Mexican, Italian or Indian, this unique cafe has something for every kind of foodie. The menu has a special section namely Kaidio ki pasand (choice of the prisoners) adding on to the fun. The visitors can also try the kaidi (prisoner) outfit which is a black and white striped kurta-pajama (prisoner outfit).